In spite of the progress we’ve made, nudging that closet door open still requires guts and resilience in many families and cultures. But in spite of its earnest efforts, June is the First Fall feels much like our current in-between season when you’re not sure what the day — or the play — will bring. 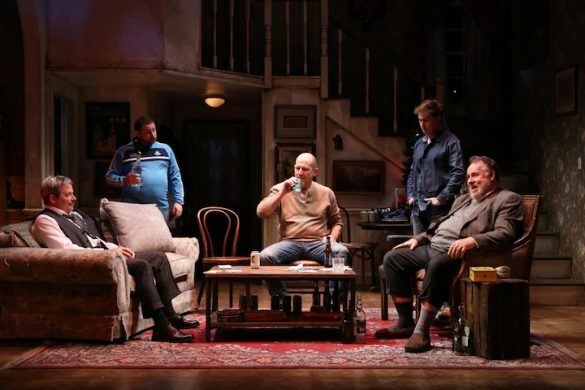 Thomas Wolfe’s adage, “You can’t go home again,” rings particularly true for Don (Alton Alburo), the central character in playwright Yilong Liu’s latest work. After high school, Don left his home state of Hawaii and fled to the East Coast for college. His sister Jane (Stefani Kuo) was beginning to think he might not ever come back to visit. Even when their father David (Fenton Li) took ill, Don decided to stay in New York. After 10 years, he reluctantly returns. “I miss the smell of the air here… the music… and riding in your Honda,” he tells his dad on the ride home from the airport. All of it is small talk. Don thinks that his father hates him. Years before, Don came out as gay in the middle of the family restaurant. As an adult, we learn that his Chinese-American family is still coming to terms with it. Still, this Yangtze Repertory production is a tepid family drama that relies too heavily on the conflict of sexual orientation to make the journey completely worthwhile. Liu adds a bit more color with the character of Scott (Karsten Otto), the family handyman and object of Jane’s affection. Yet even the revelation of his past is slightly incredulous. The story veers even further off course with a heart to heart conversation between Don and his father. 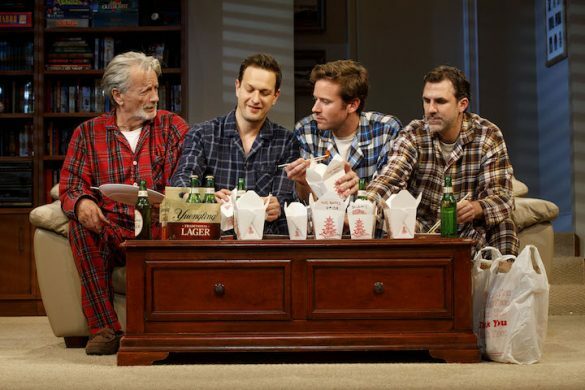 “Tell me about him,” David asks of his son’s relationship. Don proceeds to tell him that it’s complicated because his Italian boyfriend has a husband and children. The three of them were content with their polyamorous arrangement until they went traveling. Lost for words, David slinks away. Don storms off in anger. Discretion is obviously lost on Don — and on the playwright. Opening up and being honest is one thing: seeking understanding and approval of your thrupple from an emotionally reserved, traditional father is a bit off the rails. Baby steps, Don, baby steps. Yu Qin (Chun Cho), the family matriarch rounds out this five-person cast and adds dimension to the cultural specificity of Liu’s work. Although she is deceased, she appears in several flashback scenes. 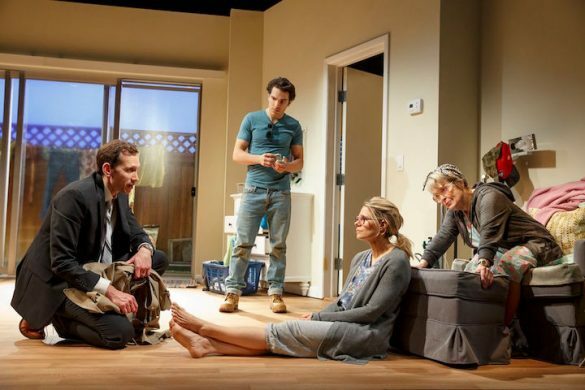 Casting Director Wayne Chang has assembled a perfectly functional cast, but there are no major standouts or emotionally palpable performances. 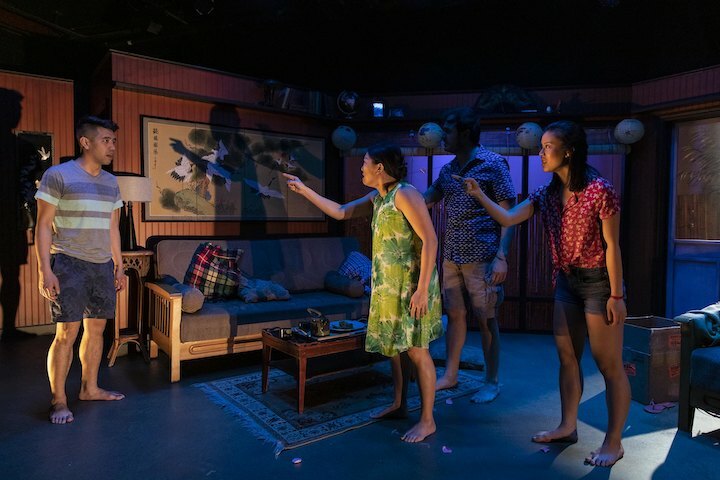 Director Michael Leibenluft handles the relatively thin material in a straightforward manner and scenic designer Jean Kim has created a modest but effective depiction of a casual Hawaiian home. Filmmaker Ang Lee tackled similar themes in his 1993 film The Wedding Banquet. That had what Liu’s play is lacking: heart, humor, and humanity. Also, Lee’s premise felt fresher in 1993. In 2019, it’s an earnest, but tired tale. Ryan Leeds is a freelance theater journalist who lives in Manhattan. He is the Chief Theater Critic for Manhattan Digest and a frequent contributor to Dramatics Magazine. Follow him on Twitter @Ry_Runner , Facebook, or Instagram.